When we go to our local pizzeria, we see some options that seem strange or even gross. Personally, we don’t know who would ever put anchovies on pizza—but hey, that’s just us. Some love pineapple on pizza while others are abhorred at the thought. Our tastes and preferences generally differ; however, these are some pizzas that we can all agree are pretty strange. Fast food on fast food? Not our cup of tea, but apparently it works for a lot of people. 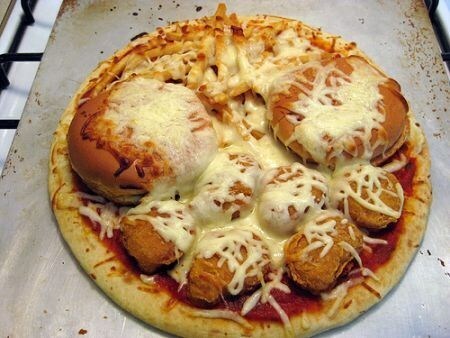 Basically, just throw your McDonald’s order on your pizza and just like that you have the Happy Meal Pizza. I sure hope you like seafood. This pizza is topped off with some expensive delicacies including caviar, shrimp, and bits of fish. 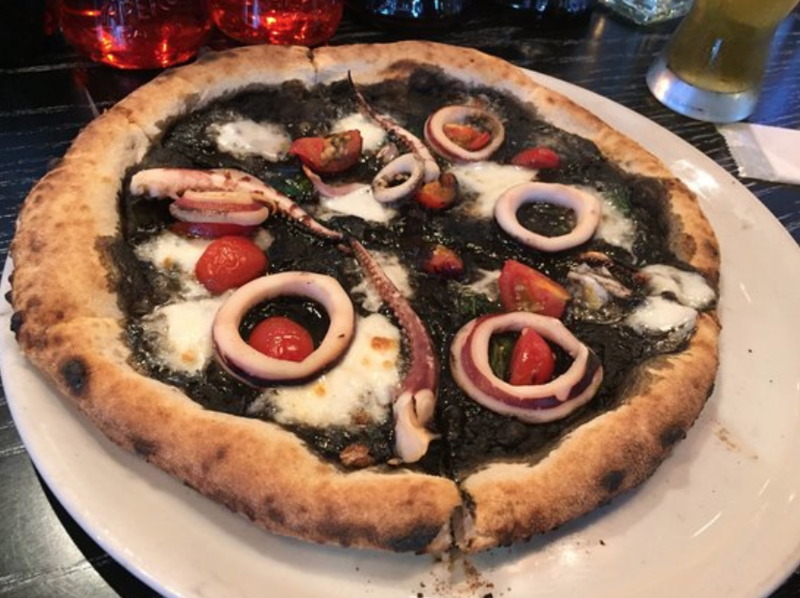 Oh, the traditional tomato sauce has also been replaced with squid ink—interesting right? The Industry Kitchen in New York serves a pizza fit for a king, literally. 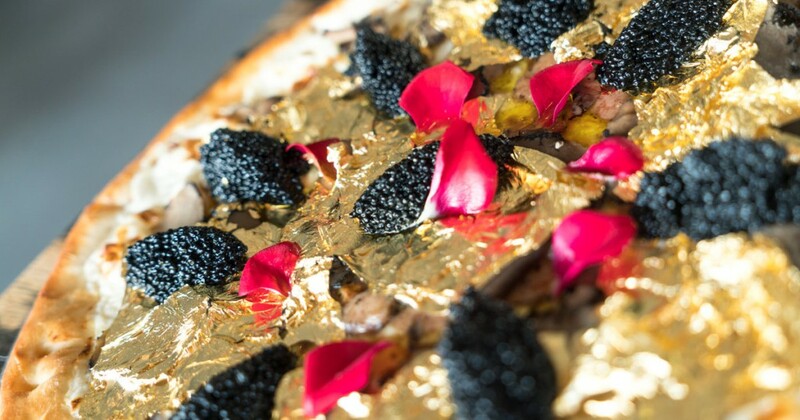 This $2000 pizza is topped with English Stilton cheese, 24k gold leaves, caviar, French foie gras, and truffles. Want to spend a pretty penny on your pizza? Then the gold-leaf pizza is the option for you. I have heard of a banana pizza and I’ve had curry. But I have never thought to combine them. 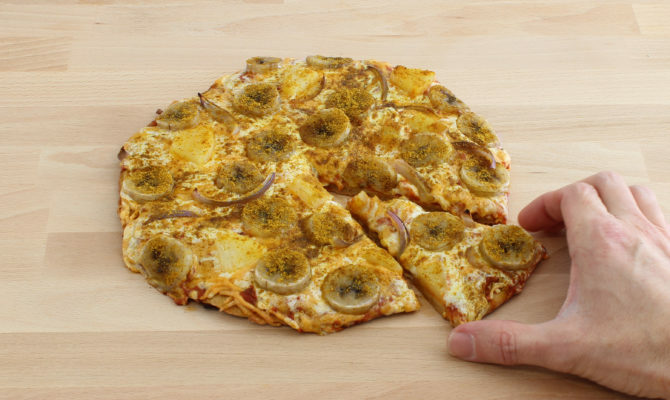 In Sweden, apparently it is common to have a banana curry pizza. You just add cheese, bananas, red onion, and curry. You can also add pineapple and ham—as if it wasn’t already weird enough. Pizza Hut is known for their creative crusts. They have done garlic knot crusts, cheese-stuffed crusts, and even pretzel crusts. But in 2015, they took it to a whole new level; they created a pizza that should tug at the heartstrings of nearly every American. 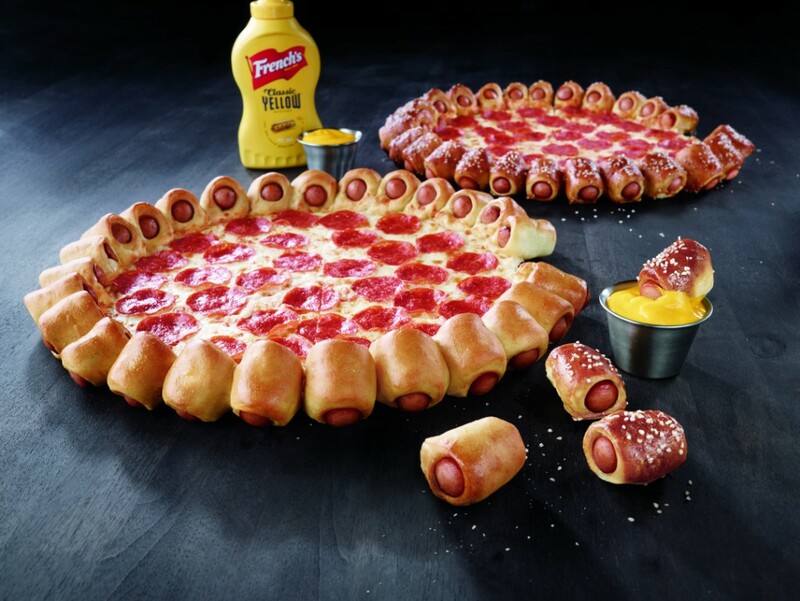 They created a pizza where the crust was hotdogs. 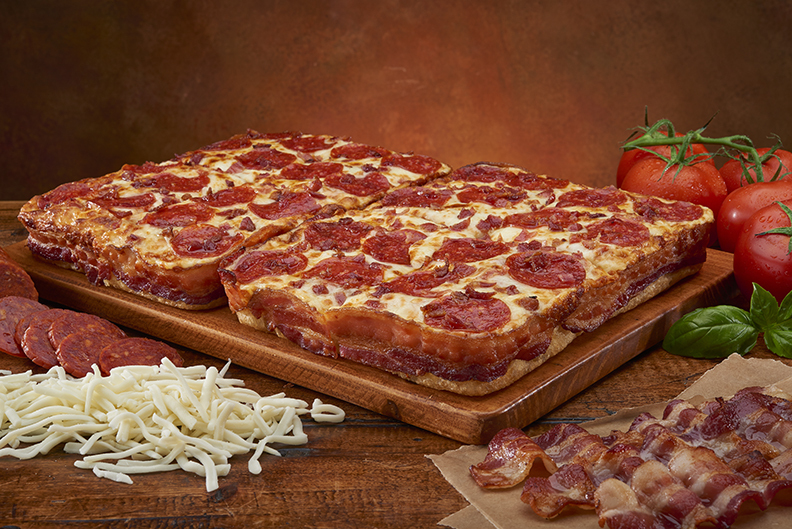 Not wanting to be overshadowed by Pizza Hut, in 2015, Little Caesars wrapped their deep-dish pizza crusts in bacon. There isn’t much that bacon doesn’t make better so why wouldn’t it work on pizza? How much do you love pizza, enough to top pizza with even more pizza? The Meta Pizza is the best pizza for pizza lovers. Imagine, you can’t decide which pizza to get so you just order a pizza topped with 5 of your favorite mini pizzas! Genius. 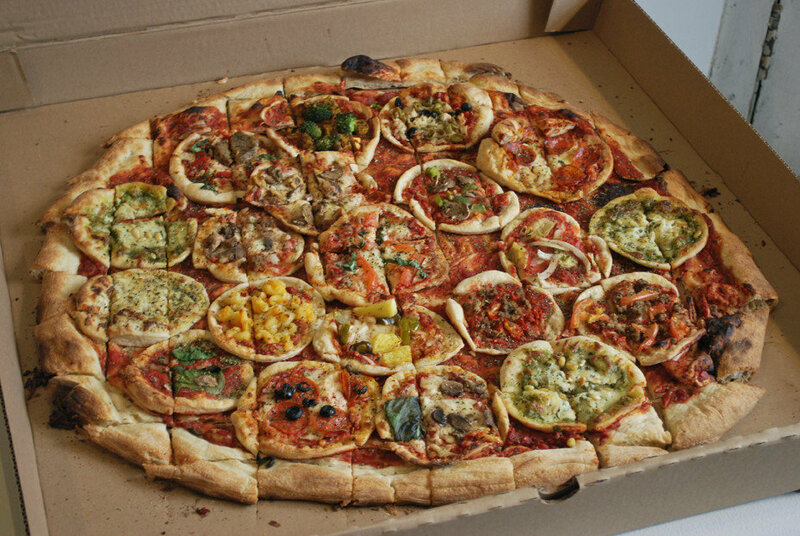 Would you try any of these pizzas? If not, what is the weirdest pizza that you have ever tried? Leave a reply! At The Pizza Factory, we don’t offer too many weird options. But if you are just looking for some delicious Italian food, make a reservation! No Comments to "7 of the Weirdest Pizzas Ever"